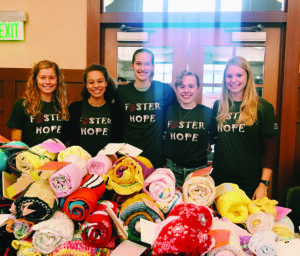 The one thing senior Tori Wichman has kept from her years of growing up in foster care is a blanket from the non­profit Children’s Lantern. It’s pink, with purple threading around the border. Wichman led a service project this October to help other kids in foster care get the same sort of comfort she got from that blanket. For the women’s track team’s annual service project, Wichman orga­nized a letter-writing cam­paign to write 200 letters to pair with blankets and send to kids in foster care. Wichman planned to have stu­dents write letters of encour­agement in the Grewcock Student Union one Monday in October. She got a warm response: The track team reached 200 letters far before the end of the event. Wichman encouraged stu­dents who didn’t know what to say to write any kind of reas­surance, even jokes. “God will get the blanket and card to the child who needs it, whether they need a Bible verse, a quote of encour­agement, or a joke,” Wichman said. 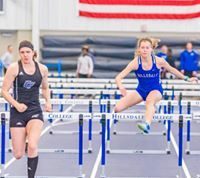 “Tori has a tremendous heart for foster care and adoption…it was neat to see so many of our ath­letes get behind this project,” head track and field coach Andrew Towne said in an email. The blankets paired with the letters were made by a group of older women from Wichman’s church, Family Christian Center in Defiance, Ohio. The women, who call them­selves the “Thread Club,” make the blankets and pray over them per­sonally. Then the blankets are sent to Children’s Lantern, a non­profit orga­ni­zation that serves the foster care com­munity. Half of the blankets and letters from the track team’s project will go to job and family ser­vices in Hillsdale County, and the other half will go to the Hope House Bou­tique, which offers resources for foster kids and their parents. Wichman said she got the idea for writing letters to foster care kids from the ini­tiative of Children’s Lantern and from the Day of Thanks, an event where Hillsdale stu­dents write thank-you letters to donors, pro­fessors, friends, and family. Wichman’s ini­tiative to serve the foster care system comes largely from her own past growing up in foster care. Wichman was put into the foster care system at age 12 after being sep­a­rated from her men­tally ill single mother. Wichman lived in 12 foster homes during her years in foster care. When she was 16, she found out about Children’s Lantern and began vol­un­teering there. She has been with them for five years and now works with them part time as a family care coor­di­nator. “I was put through this part of my life, a very dif­ficult part of my life, so God could be glo­rified — through my knowledge from being in it, I could help a system that was broken,” Wichman said. Many children are let out of the foster care system, or “eman­ci­pated out,” when they are legal adults. 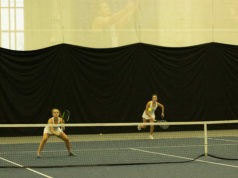 Wichman was eman­ci­pated at 18, and spent the next four months moving from house to house, trying to graduate high school and finish up her last track season at the same time. During this tur­bulent time, Wichman sought advice from her high school track coach. After four dif­ficult months, Wichman’s high school coach offered her a home with his family. “They’re who I go home to. They’re my family now,” Wichman said with a smile. Not all foster care stories end like Wichman’s. Childrensrights.org says that only 3 – 4 percent of foster children go on to bachelor’s degree or higher, as opposed to 36 percent of kids from a normal home. According to the same website, more than 670,000 children spent time in U.S. foster care in 2015. If she could change any­thing about the foster care system, Wichman said that she would let kids lead more normal, stable lives, while getting rid of many of the stereo­types placed on foster children.